Warped Tour Interview: RDGLDGRN : TheyWilllRockYou.com – For the love of music! Serving Boston and Greater New England. 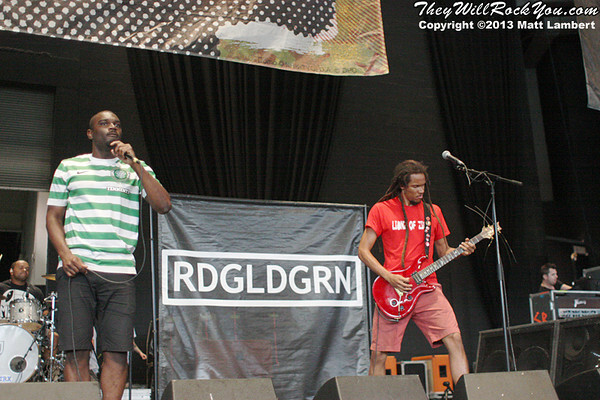 Warped Tour newcomers D.C’s RDGLDGRN (pronounced Red Gold Green) are playing the whole 2013 tour. I got to chat with Red, Gold and Green, about their experiences so far as a band; highlights of the tour so far and when their new length album will be out. For someone that has never heard of RDGLDGRN please describe your style and what you sound like. Gold: It’s like indie rock and hip hop music, very simply. Green: [agrees] It’s the simplest way. You guys have an EP, and have already worked with artists like Dave Grohl and Pharrell Williams? How did that relationship come about? Gold: Our producer new Dave, and Dave was filming sound city, so they connected he shared our music and he liked it and agreed to drum on the record. He was also cool with Pharrell’s manager so he set that up as well, so props to our producer Kevin Augunas. Are there other artists that you’d love to work with? Gold: Andre 3000, Q-Tip, John Lennon. Have you been enjoying Warped Tour so far, it’s your first time, right? Red: It’s been good, Warped Tour is great. Well Gold’s been to and played Warped Tour before a long time ago. But this is myself and Green’s first time at Warped tour, and it’s really great for many reasons. Do you have any highlights of the tour so far? Gold: Yeah, definitely, our hometown show was definitely the most exciting people were jumping up and down lots of love, crazy photos, and singing along. 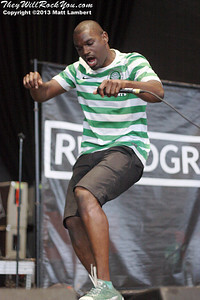 Green: Also the first time they played our new song, “Lootin’ in London,” on the radio and it beat Muse in a cage match. Sorry to Muse, we like them. Red: Shout out to D.C. 101. Talking about your new song “Lootin’ in London” where did the inspiration for the song & music video come from? Green: We love football and we love D.C. and that’s why that song was made. The song is homage to both football and D.C. So it has the football vibe, also explain the vuvuzela’s that you brought with you on tour at your merch tent. Green: Same thing, in no way are we ambassadors of football, that’s David Beckham, but we represent football to the fullest. No way we are ambassadors to D.C., that’s Wale, but we represent both to the fullest. Being the new guys playing the Warped tour as a group, has any veteran band given you any advice/guidance? Red: We sat down with Motion City Soundtrack, and one of the guys from Reel Big Fish we had lunch with him like the 2nd or third day. They were just telling us about showers, bathrooms, and important stuff like the way food is now versus what it used to be like 10 or so years ago. Green: How being cool with the bands work and stuff like that. The guitar player from the Starting Line, Matt Watts is your general manager, what has it been like working with him, were you all fans of his band? Gold: I actually hated the Starting Line, and it was funny having a conversation with Watts and let him know I couldn’t stand his band. But then my band mates liked them a lot so it’s funny. Green: I was very ignorant to the whole pop punk scene. Gold: We gave him a nickname; we call him Buzz Watts because he looks like Buzz Lightyear from Toy Story. We got him a giant Buzz Lightyear toy that we sent to him for a Christmas present. When can we expect a full length from RDGLDGRN? Red: The end of August, early September, is when we’re hoping it should be out.